Tonight's meal from Papua New Guinea is a traditional, rural dish that I have slightly westernized via the Fair Trade Cook Book. A slow-cooked, layered dish that is typically simmered over a grated open fire using a 5 gallon drum and banana leaves, I had to substitute a cast iron dutch oven and spinach leaves. I couldn't find a clean drum and my grocery store was out of fresh or frozen banana leaves, which is a first. Other than that, I stayed true to traditionally used root vegetables, greens and fruit. Mumu can be cooked on the stove, but since I dug a fire pit last year, I was able to cook Mumu on an open fire as is traditionally done. The combination of meat, fruit, root vegetables, greens and coconut milk cooks up beautifully, and the prep involved is minimal, as you can use whatever vegetables you have on hand to make this delicious and traditional dish. Located in the Southwestern Pacific Ocean, the Independent State of Papua New Guinea is closest to Australia to the south and the Solomon Islands to the east. The eastern half of the island is owned by New Guinea and the western portion is a part of the Indonesian provinces of Papua and West Papua. The majority of the population live in rural areas, many in extreme poverty. A mountainous country with a tropical climate, the island is one of the most culturally diverse in the world, with 850 indigenous languages and societies. The country also has one of the richest eco-systems in the world, and boasts over 3,000 varieties of orchids along with 9,000 varieties of plants, species of birds and animals, many of which may yet to have been discovered. Cuisine in Papua New Guinea includes many root vegetables such as taro (yucca), sweet potatoes, palm, bananas, kau, kau, avocado, mango, pineapple and many leafy greens. Chicken, pork and sea food are typically eaten, often wrapped or layer using banana leaves. Lightly oil a large metal casserole dish or dutch oven. This dish is traditionally never stirred. Turn the flame down to the lowest setting - or make sure open fire is burning slowly and simmer gently for about 1 hour or until the meat and vegetables are tender and cooked to your taste. Traditionally, the meal is eaten with your hands. Final Assessment: We all loved this meal, and the combination of fruit and meat is always one I enjoy. The yuca and root vegetables are satisfying and the spinach and kale just make you feel good. I love that any vegetables and fruits you have on hand can be used. I'll definitely make this again. Love the presentation! Summer's almost here and I'm looking forward to trying some of your recipes, especially the ones using the fire pit! Thanks, Mary! You can have lots of fun with this one. Any ingredients you have will work - I think mango could be really good with this! Another absolutely fascinating and utterly delicious-looking post. Thanks so much for the positive feedback :) This was a fun one! Hope you try it! I love the idea of cooking in a dutch oven- a new recipe for B.O.W. camp! I wonder- would a galvanized washtub work for the drum? I'm not sure if there would be some kind of oxidization between the metal and the acid in the vegetables that would effect the color and flavor Ttry it with something small first and let me know, then maybe I'll try it too - way lighter than hauling cast iron around! 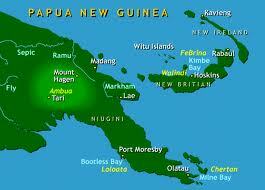 Papua New Guinea is on my wish list of places to visit. So exotic! Thanks for this lovely recipe. Thanks, Beth! It's way up there on my list too...road trip?? Thanks for connecting!